The LOFTY wall padding is the perfect underlayer in wall upholstery. Lofty and CES tracks work very well together. A great combination as they are both 1/4″ thick. A 100% natural cotton made in the USA. It is 110″ wide. For your convenience Lofty will be shipped folded in half. A bolt has 15 yards equal 45 feet. 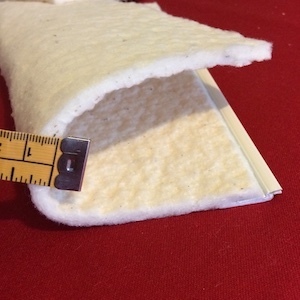 Lotfy wall padding is 1/4″ in thickness. The bolt weight is 30lbs. For example, 1 roll of 15 yards used railroad will upholster a room of 10′ x 10′ with 9′ in height. The bonus is a minimal waste and stapling and fast installation. Ask for a sample, click here. The idea behind our Lofty wall padding is making it work with the CES tracks. 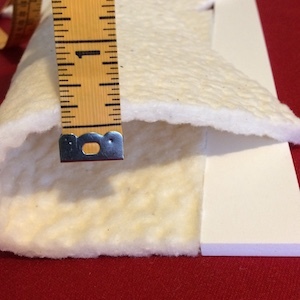 As you know Clean Edge System has a 1/4″ projection, so we needed a layer of padding with the same thickness. It is now possible with LOFTY. You will only find natural cotton like this one through CleanEdgeSystem.com. It is an exclusive product made for our company. All other paddings are far too thin. Therefore, Lofty is the right product, one layer on the wall and that’s it. Once the track installed around the perimeter of the room, staple the padding on the wall, just at the edge of the track. Staple every 3″, then trim the excess padding. If the ceiling height is 9 feet, we recommend to use Lofty railroad. Start at the top right corner and keep stapling toward the left wall. Don’t stretch while attaching to the wall. But slightly stretch and staple across the bottom. Do the sides and trim. Keep the rubber lips free from the cotton padding. That is a minimum of 3/8″ away from the head of the track. You are now ready to fit the fabric. We have selected cotton for several reasons. The first and foremost, Lofty is eco-friendly and does not attracts dust like other. It provides good insulation in a room. Static electricity can be problematic in some states. Especially in dry air, in altitude, Colorado is a good example. 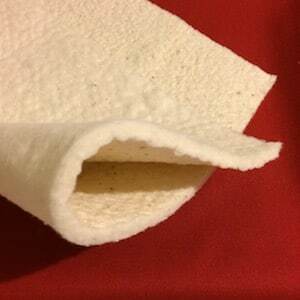 Also, cotton creates good natural support to an upholstered wall. Lofty cotton padding is easy to use as it drapes well. You will enjoy installing the light weight Lofty. Where do I find CES tracks? Clean Edge System tracks are found in this website. Follow the link to the page Wall upholstery track system. You have all information needed to install including videos on YouTube. CES tracks are widely used in all types of homes.